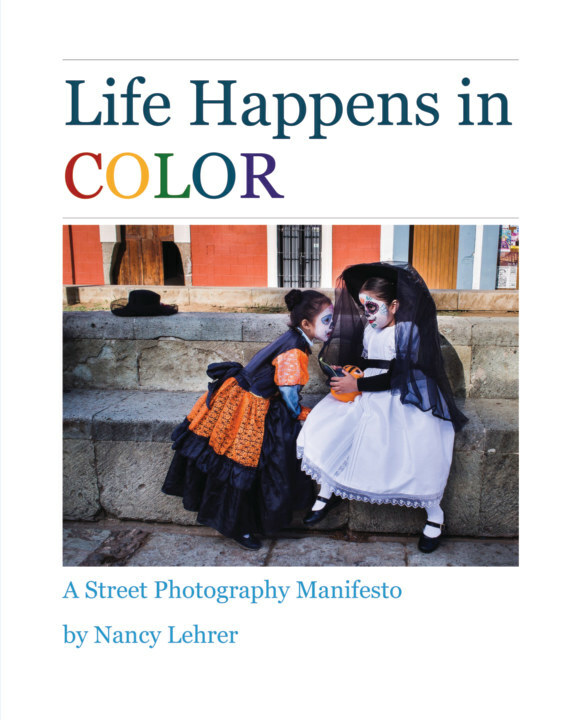 In the chapters of this manifesto, I explain my approach to street photography as an informal genre of documentary photography and visual story telling. I explain how I go about recognizing and then communicating the stories that I observe. Within the descriptions of my images, I detail my process for identifying photographic opportunities, my thoughts while taking an image, and how I evaluate an image’s narrative strength during editing. Nancy Lehrer: Computer Scientist by profession, classical musician by history, and photographer by passion. "I set out to capture daily life and interactions. These life events are sometimes celebratory but more often commonplace. They are made up of simple scenes, conversations and actions. Concentrating on layers, color, and gesture I aim to weave a specific action in with its backdrop. I am an observer, seeking to find and record a bit of today’s culture and community." Nancy Lehrer, is an independent photographer based in Thousand Oaks, California and has been using photography to capture her unique world-view for most of her life. Nancy has studied photography from several American photography masters including Jay Maisel, Sam Abell, Gerd Ludwig, and Arthur Meyerson. She has received several local awards, and she lectures on photography in Los Angeles and Ventura County California.